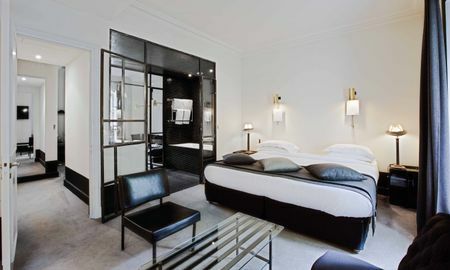 L'hotel Particulier de Montmartre is not a hotel like any other. This grand 3-story mansion, formerly belonging to the Hermès family, has been transformed into a unique private hotel. It is an exceptional townhouse offering luxurious services, with contemporary design in a unique environment. Atypical, all suites have made the object of important research and original creativity. Wallpapers have been designed and printed with the help of artists; beds and furniture have been carefully selected. Each one of the five rooms was imagined in a spirit of bringing outstanding comfort to guests. Renowned artists were invited to brainstorm on the concept of each one of the Suites in an attempt to bring in some of their own artistic perception. 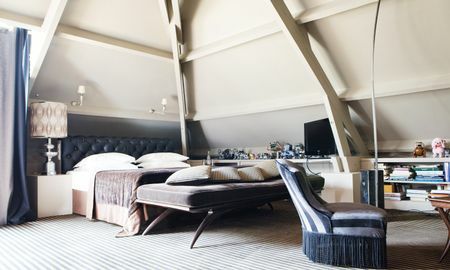 Nested in a secret passage in the heart of historical Montmartre, the hotel is surrounded by an unusual and luxuriant garden designed by Louis Bénech, an internationally renowned landscape architect. This heaven of peace, in the heart of Paris, is built in several levels each one hidden by flowered clumps offering many intimate spaces for you to enjoy your tea or an "aperitif". 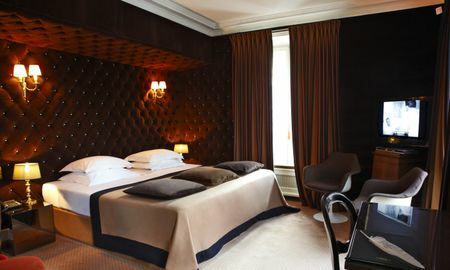 At l'Hotel Particulier Montmartre, intimacy, calm and wellbeing are privileged. In order to discover L'hotel Particulier de Montmartre, one has to take a short paved path, almost secret, located between “l'avenue Junot” and” la rue Lepic”.Between trees and plants some of the “maquis de Montmartre” remains, and just in front of the intriguing “Rocher de la sorcière” (The witch's rock), a gate will lead you to this beautiful mansion from the Directoire period. Metro Lamarck-Caulancourt (line 12) or metro Blanche (line 2). Please note that the bar and the restaurant will be closed from 3rd to 18th August 2015 included. However, the hotel will remain open and will offer the possibility to have a drink in the garden till 07th August.